Maybe the coolest car I have ever seen and of course, I've never seen it in person. And when I speak of "it," I mean "it," because the one pictured here is the only one still around. Multiple sources assert that only five were created by Mercedes, and this one alone survives. 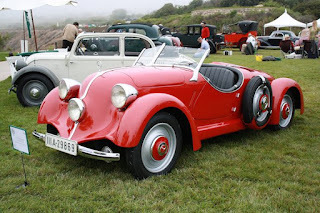 Although Mercedes had been hoping for volume production, the Sports Roadster suffered some disadvantages in the marketplace. The mid-rear engine configuration and short wheelbase ruled out any possibility of a back seat, while the 16-gallon gas tank mounted in the car's nose ate into already scarce luggage space. And the price, at 6,600 deutschemarks, was nearly double that of a basic 130 sedan. Despite the factory's best efforts to promote the 150 as "a spirited sports car" with acceleration that was nearly equal to that of larger, supercharged cars, buyers were not interested. The 150 Sports Roadster remained in the catalogue through 1936, but few were sold. Even Mercedes-Benz doesn't know how many were produced: One record says that 20 examples were built, while another puts the number at five. There is proof of the sale of just two cars, one of which was reacquired by Daimler AG in the 1950s. 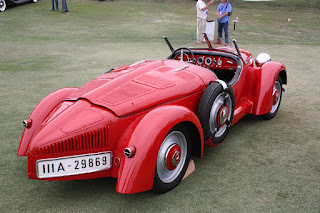 The 150 was impractical, especially during the Depression. But it was and is beautiful. Recently, I watched a re-run of a 2010 episode of Chasing Classic Cars in which classic car-restorer and show host Wayne Carini drove the surviving 150. That had to have been fun! I remember first hearing this song and being utterly blown away by it. It seems to speak to me on two different levels. One is about the things that we can rightly look for in this world. Love, for example. The second level is about the one thing we can never find in this world, that only comes from the God we meet in Jesus Christ, through Whom God's kingdom comes and only comes in its fullness when, like our Lord, we die are raised from death by the One Who becomes our Father through Christ and our faith in Him. It's sad when the things from the first category prove ephemeral or beyond our reach. It's sadder, eternally sadder, when the eternal gladness God wants to give to us proves elusive to us beyond the gates of death because we turn our backs on Christ, the Savior Who refuses to turn His back on us. In this world, we will never find all that we're looking for. We have eternal appetites; this world is finite, time-bound. But, as we trust in Christ, we can be assured that God will not only give us what we were always looking for, even when we have no idea that He is what we were looking for all the time, but more. Saint Paul writes: "Now to him who is able to do immeasurably more than all we ask or imagine, according to his power that is at work within us, to him be glory in the church and in Christ Jesus throughout all generations, for ever and ever! Amen" (Ephesians 3:20-21). I believe that one day, in the words of another musician I love, John Ylvisaker, God "will make sense of our loving and hoping." The Holy Spirit enables me to trust that the God Who sent His Son to die and rise for me (and for you) will do that for all who dare to trust in Him. Jesus promises that "the one who endures [in faith in Him] will be saved" (Matthew 24:13). I try to remember that every day because I still haven't found what I'm looking for. Isn't The Edge the most exquisitely wonderful guitarist ever? OK, get past the fact that Dylan doesn't have a great voice. This tune, from Planet Waves, which he recorded for David Geffen's label when he was in a dispute with Columbia Records, is not in the category of Like a Rolling Stone or Blowin' in the Wind. It's a simple, happy love song. And I'm good with that. "And more and more and more"
Today, I want to talk with you about growing up, becoming mature. We all know people, I’m sure, who have grown older, but have not grown up. They’re just as childish at fifty-five as they were at five. They go through jobs, partners, and friends as quickly as Kim Kardashian produces selfies. The reason for this is simple: Growing up is hard work. It’s easier to be childish. Growing up means learning things like deciding on our values and if we will live in accordance with them, the art of compromise, how to handle disappointment, how to handle success, being accountable to others, living within our means, or striving to be better today than we were the day before. Growing up means moving away from being me-centered to being we-centered. Since we all have to live together, it's the responsibility of every human being on the planet to grow up. And to never stop growing up because every new phase of life, right up to the moment of death, challenges us to grow, change, adapt, and create. We are either growing or we are dying; there is no third choice. Now, we all know this about growing up in how we relate to our families, our friends, our jobs. But in my years as a pastor, I have been astounded by the number of church-going Christians who work hard and intentionally at maturing in every other aspect of their lives except the most important one, their relationship with the God we know in Jesus Christ and with the people of Christ’s body, the Church. I can’t tell you how many good adult people I have watched over the years try to confront the big challenges of their lives--job loss, the loss of loved ones, relationship issues--with the faith of a newly-confirmed fourteen year old. There's nothing wrong with the faith of a newly-confirmed fourteen year old for as long as the confirmand is still fourteen years old. But because many people don’t keep growing as disciples of Jesus Christ beyond the age of fourteen, they’re ill-prepared to deal with the challenges and possibilities of adult life. Listen: We only more fully experience the greatness of God’s love, grace, and power in our lives when we commit ourselves, intentionally, to daily maturing, as disciples of Jesus Christ. As Christians, we need to daily commit ourselves to putting away the ways of childhood behind us. All three of our Bible lessons for today present God’s call to those who would follow and claim to believe in Jesus Christ to grow up in their faith. This call comes through with crystal clarity in the second lesson, Ephesians 4:1-16. The calling that the Ephesians received is the same calling that Juliet has received this morning: to live and be the trusting children of God that Christ’s death and resurrection has set us free to be. We are to live our calling as people who have been bought and paid for by Jesus Christ through the expenditure of His body and blood on the cross. We’re to live our faith like we mean it. Do we mean it when we confess the words of the Apostles’ Creed or offer the Lord’s Prayer? Paul would say, then we need to live it. Do we mean it when we say we have been saved by God’s grace through faith in Christ, that we are committed to love God and love neighbor, that we accept Jesus’ great commission that we make disciples? Paul would say, then we need to live it. Are we repentant for our sins and committed to showing humble compassion to our fellow sinners? Again, Paul would say, then we need to live it. In Luke 16:10, Jesus says, ““Whoever can be trusted with very little can also be trusted with much…” When we were growing up from childhood to adulthood, it was exciting and exhilarating being entrusted with more demanding tasks as we showed ourselves to be increasingly capable. We need to work at being grown-up in Christ so that we're people who can be entrusted with more and more of the challenging and important work of being Christ’s ambassadors in our everyday worlds. Nothing is more exhilarating. Christians are not Lone Rangers. The Christian life is not about "Jesus and me," but about "Jesus and we." You can’t do Christian faith solo because you can’t do Church solo. When Juliet was claimed by God this morning in the waters of Holy Baptism, she was also welcomed into the Lord’s family, the body of Christ, the Church. As Christians, as disciples who are part of the Living Water community, we’re to be gentle and humble in our dealings with each other. We’re to be patient with each other, knowing that, though we may all be committed to growing up as followers of Jesus, the Lord isn’t finished with any of us yet. Just as life in our families is meant to fortify and prepare us to deal with the world each day, so life in the Church is meant to fortify and prepare us to move out into our daily lives with faith and hope, the power to resist temptation, the power to share our faith, the inspiration to keep surrendering to Christ in prayer and study of His Word. And the Church is also meant to fortify and prepare us for all that God will have for us to be and do in eternity with Him. In churches committed to helping disciples grow up, leaders equip the rest of the body of Christ to use their gifts, talents, abilities, and lives to live their faith out in the world, not just to be volunteers for church activities. The point of Living Water's mission trips and other mission efforts, for example, isn’t just to serve the people we serve together in Jesus’ name. It’s also to take us out of our everyday comfort zones and teach us to commit the same acts of witness and service in Jesus’ name in our everyday lives. And my job, Dan’s job, Mark’s job, the job of every Sunday School teacher and ministry leader, is to equip you to be disciples in your everyday world, to set you free to grow up as disciples of Jesus Christ. To equip you grow up. We are called to equip you to reach up to God and reach in to others in this church family and to pray and study God’s Word with others in our church family, so that you can reach out to the world with confidence and hope and faith in Jesus Christ. As we implement Simple Church and the discipleship culture at Living Water, you will hear more and more about these disciplines of the Christian life. In coming months, we’ll begin some tiny small groups that will carry the seed of deepened discipleship and spiritual growth to the next step in our congregation and we will offer frequently-changing educational opportunities for you wherever you are in your life, wherever you are in your spiritual growth--from reaching up to reaching in to reaching out. We want every disciple of Christ who is part of this congregation to have the chance to grow up and keep growing up. That process should start for all of us, from the moment we are baptized and continue to the moment we pass from this life into the presence of our Lord Jesus. God’s Holy Spirit is at work in this congregation. You can sense it every time we gather--whether for worship or a church council meeting or a mission effort. My experience is that every time God is doing great things in a congregation, Satan tries to mess things up. He attacks. He sows division. He puts up obstacles. That's because Satan is the biggest jerk in the universe. But, we must always remember that, no matter what trouble he may cause us, Satan has already lost. Jesus has already conquered sin, death, and Satan. And we who confess Jesus Christ as God and Savior and Lord belong to Jesus Christ forever. If we will commit ourselves to working at growing as disciples of Christ, to lives in which God will keep us growing and thriving through daily prayer, corporate worship, the study of God’s Word, service in Jesus’ name, engagement in small groups, and giving to the cause of Christ, both through Living Water and elsewhere, we will be ready for anything, unshakeable, able to speak God’s truth to anyone with love and respect and compassion. And we will grow to be a united force in the world for the One Who died and rose to make us children of God, Jesus Christ. Wherever we may meet for worship, Sunday School, Bible study, mission work, or planning meetings, folks, this is where God is taking Living Water: to a life growing up, of continuous maturation, as disciples of Jesus Christ, so that God can use us to do all the wonderful, remarkable things He wants to do in us and through us for the world He loves. I ask you today, right now, to commit yourself to continued maturity as a Christian, to continued surrender to Jesus Christ, to continued commitment to each other as Christian sisters and brothers, for the good of every other disciple who is part of Living Water and for the good of the world we are called to reach with the gospel, the good news, that all who repent and believe in Jesus Christ will be saved.